Aiming for Accuracy Challenge | Aiming for Accuracy Pattern Co. Welcome to my fifth quilt-along, where I am thrilled and honoured to teach quilters from around the world how to improve their quilting accuracy while we journey together making the Aiming for Accuracy Challenge quilt. For more inspiration, alternative colourways are shown below. Finished size: 92" x 108"
Format: The first eight lessons are now available. The remaining six lessons will be released once a month on the 15th, from July to December 2017. Each block in the quilt has been chosen for it’s learning potential. Blocks range both in size and complexity. At the end of the quilt-along, you’ll be confident in your ability to make half-square, quarter-square and split-quarter-square triangles, as well as, square-in-a-square, flying geese, fusible appliqué and English paper pieced units. 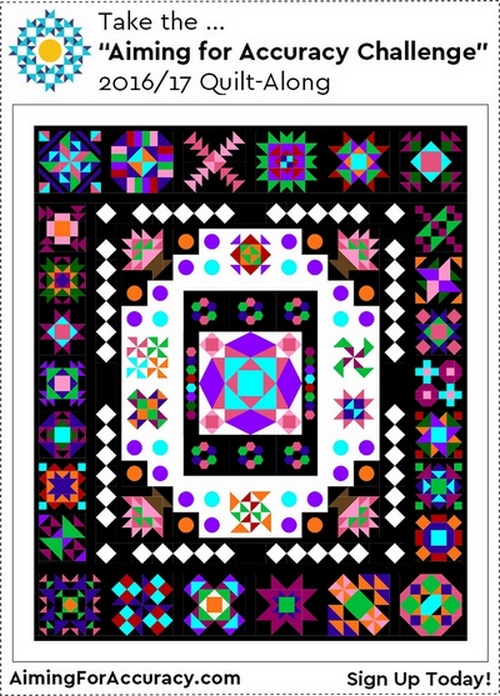 This medallion-style quilt uses two background/contrast fabrics. See the alternative colourways at the bottom of this page for inspiration. This quilt finishes at 92" x 108". A lovely over-sized queen, that drapes. There are are pieced, English paper pieced and fusible appliqué blocks. 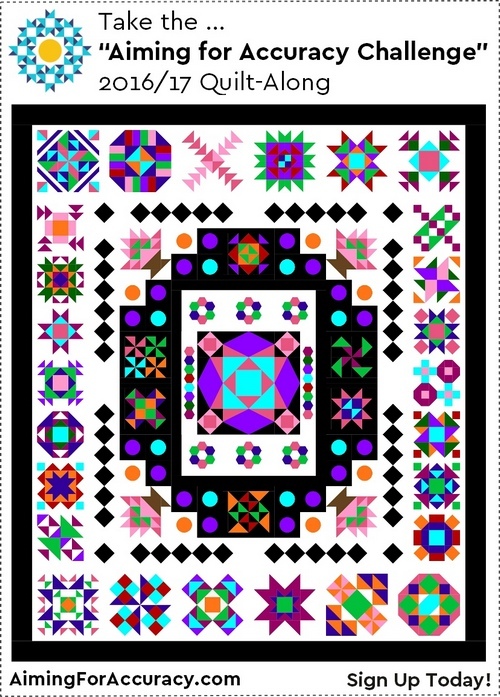 It’s a medallion-style quilt, and I’ll be incorporating some quilt-as-you-go techniques in the lessons too so that you can finish this quilt on your domestic machine. 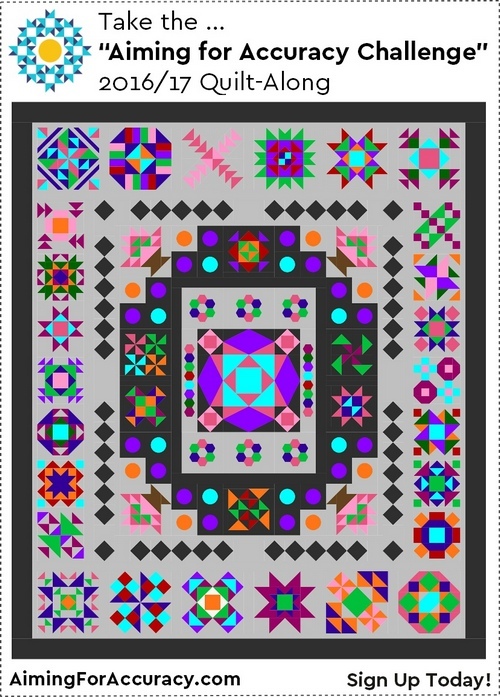 The quilt contains 38 unique blocks, each block selected for you to improve your quilting knowledge and accuracy. If you are unable to do either fusible appliqué or English paper piecing, the quilt is designed in such a way that you can easily replace those units with pieced blocks instead. Two different methods for making half-square, quarter-square and split-quarter-square triangles, as well as square-in-a-square and flying geese units. The basics of English paper piecing and fusible appliqué. How to quilt this large queen-sized design in various stages so that you can easily manage the quilting on your domestic machine. Of course, you do not have to do these steps if you prefer to quilt the large quilt or to send it out to a longarm quilter. How to avoid chopping off your triangle points when attaching sashing and joining blocks. Piecing blocks that are not the usual row/column layout. More complex and advanced piecing techniques to complete the various blocks chosen. 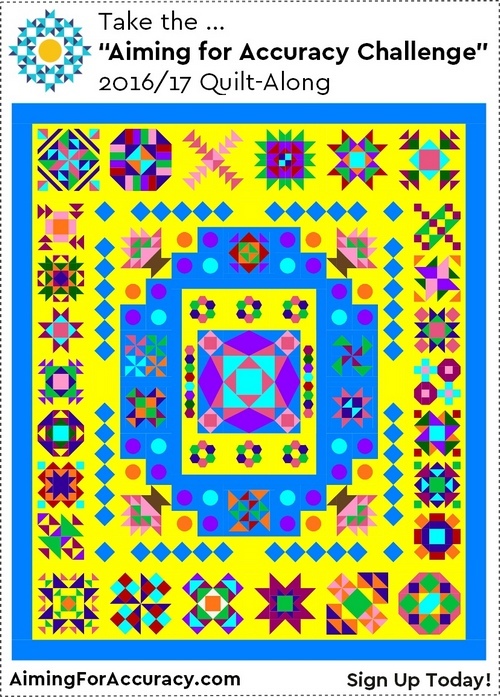 To join the quilt-along, there is a one-time fee of $30 (USD). This fee covers all of the quilt-along lessons that will be released in PDF format and, at the end of the quilt-along, you’ll download the complete Skill Building Booklet with all lessons in one comprehensive file. There will be 14 comprehensive lessons. For each lesson, you will be completing several blocks. 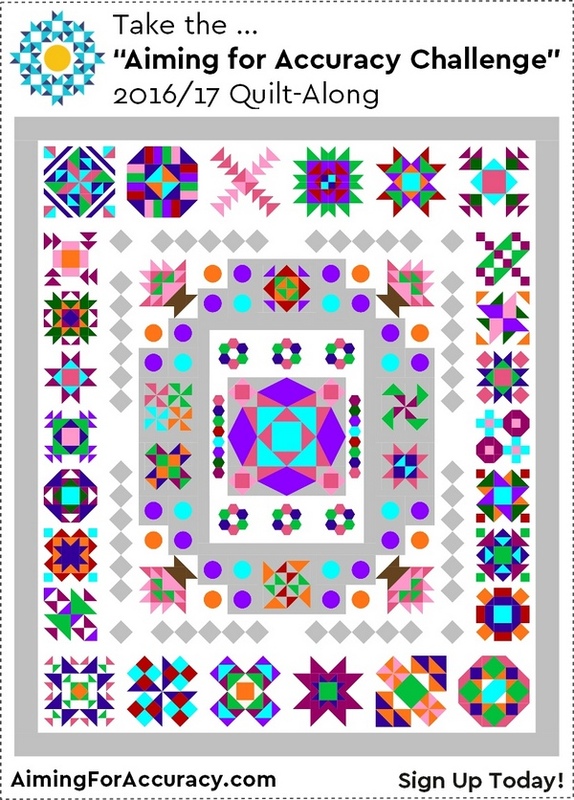 In later lessons, you’ll be completing blocks as well as joining sections of the medallion-style quilt. Lessons build upon each other, so you’ll want to do them in the order they are released. You can anticipate needing six-eight hours to complete each lesson. Of course, this will vary depending on your own experience level. 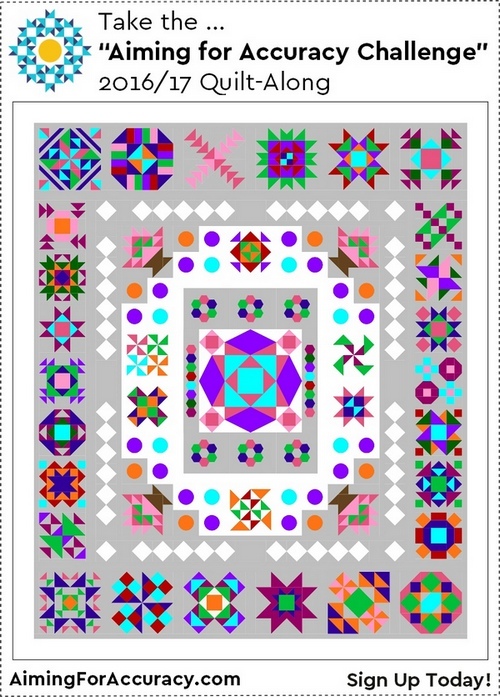 This quilt-along is taught via PDF lessons that you download to your computer. Once purchased, your account is set up on my site, that you will then access each time a new lesson is released. I send emails to all participants when a new lesson is ready for download. We also have a very active Facebook Group that you can join for additional support. UPDATED: We took a break for a few months in 2017 after the 8th lesson was released. Lessons resume July 15th, 2017 and the finally six lessons will be released once per month from July to December 2017. The fabric requirements presented below are generous. I plan to use leftover fabrics from the front when piecing the quilt backing. Please read the additional note below carefully. 5 to 6 yards of assorted prints. 5.5 yards of the main background/contrast fabric. 3.5 yards of the secondary background/contrast fabric. This includes using the secondary background for the final outer border. If you don’t want to do that, you will need 2 yards for the secondary background and 1.5 yards for the final outer border. 7/8 yard for binding (with a 2.5″ cut width). Approximately 8 yards for backing. However, this might change, so please don’t buy yet. King size batting or 96″ x 112″. Will explain further in the lessons when we start to assemble the rows in the quilt-as-you-go style. Please don’t buy yet. 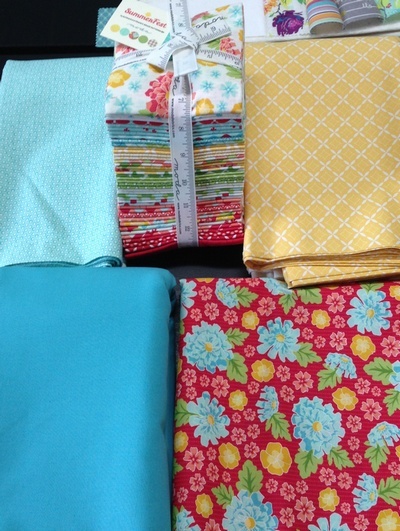 Assorted prints: The 5 to 6 yards represents 20-24 fat quarters which will give you a good variety of prints to use. You will have some leftovers, but they can be used for the quilt back. My QAL fabrics are shown below. Included is a Summerfest FQ bundle from Moda Fabrics and additional yardage to make up the primary and secondary background fabrics.